How is fibre broadband installed? Why can’t I get fibre broadband? Fibre optic broadband offers a massive improvement in broadband speeds compared to ADSL internet services, and there are always loads of great deals so you don’t need to spend a huge amount to get much faster broadband. But is fibre optic available in your area? The good news is that it’s very likely you can get fibre right now. Fibre optic broadband is being deployed around the country by multiple network operators, and while it’s not available to every home the vast majority of premises do already have access. The best place to start your search for fibre is right here on Broadband Genie. Simply go to any of our comparison pages, enter your postcode, and see if you can get fibre. Alternatively, enter your postcode below to see what fibre broadband deals are available in your area, it's as simple as that! On a national level, Openreach has been upgrading its network to fibre and you can follow the progress and check future availability on their site where they provide a map that can be searched with a postcode or phone number. Virgin Media too has slowly been expanding, though is more focused on improving performance for its existing customers rather than rapidly extending the network. Elsewhere, smaller independent network operators such as CityFibre, Hyperoptic and Gigaclear are not offering mass-market fibre but instead aiming to build networks in specific cities or specialising in niches such as rural broadband and new build flats. Between all of these it’s very likely you can get fibre optic broadband, and in many cases you’ll have the choice of multiple networks and packages. FTTC, FTTH and HFC - what are the different types of fibre? There are several types of fibre optic broadband, and each differs when it comes to availability. Fibre To The Cabinet (FTTC) is the type of fibre broadband used by Openreach (BT) network services such as Sky, TalkTalk and BT itself. Fibre optic cables reach as far as the green street cabinets, then the connection is carried into homes using the telephone line. If you get fibre broadband using your regular telephone line, then you have FTTC. While it’s not as fast as other types of fibre, it is quicker and easier to install so this has widest coverage across the UK. Fibre To The Home, also known as Fibre To The Premises (FTTP). This is a “full fibre” service, using fibre optic cabling all the way into homes. This can deliver incredible performance, but it’s very expensive to install so only a tiny percentage of us are lucky enough to have access to this type of connection. 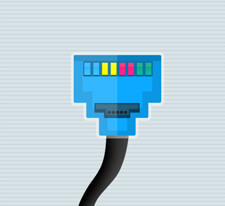 Hybrid Fibre Coaxial is the technology used by Virgin Media. It is similar to FTTC in that fibre optic goes to the street cabinet, but instead of a phone line the connection into homes is achieved with coaxial cable. Virgin Media operates its own network, and has a smaller coverage footprint than the Openreach FTTC network, though it is still available to more than 60% of premises. If you’d like to learn more about fibre optic broadband technology, including information about fibre speeds and how to choose a fibre deal, read our beginner’s guide to fibre broadband. Installing fibre from a provider such as BT, Sky or TalkTalk is similar to standard ADSL broadband. It typically takes around 14 days to activate, and may require an engineer. They may install equipment in your home, but in some cases this may not be necessary and all that you’ll need to do is plug in the router on the day of activation. A phone line is required to use any Openreach (BT) network fibre, but you do not need to get an inclusive call package unless you use the phone for voice calls. If you would prefer not to have any phone service, Virgin Media can offer a broadband only service. Virgin Media fibre optic requires a Virgin wall socket. If your home already has a socket you may be able to select Virgin’s “QuickStart” option - this is a DIY option which can be activated in as little as week. Otherwise, an engineer will need to attend to install a socket. Sadly, fibre broadband is not something that’s available to every one of us, and so you may find that fibre is not yet available in your area. This can be due to a wide variety of reasons. Much of the expansion of fibre optic broadband is driven by demand, and this means that rural communities may not yet have fibre because it was viewed as economically infeasible to upgrade the network. Projects such as Broadband Delivery UK (BDUK) have been working to fix this by providing additional funding, but you may have to wait a little longer. In a few outlying cases fibre optic broadband may never be available, at least for the foreseeable future. This could happen if your home is very isolated and where the cost for installing cabling would be very high. Sometimes you may carry out a fibre postcode check and find that it tells you fibre is available, yet when you try to sign up to a provider you’re unable to get the service. This occurs because the exchange serving your postcode has support for fibre optic, but it is not actually available at your address. Typically this is due to your home being too far from the exchange, outside the maximum range for FTTC. There are also situations where fibre optic is not available in areas you might assume have very good connectivity. For instance, parts of London may have comparatively poor internet service despite being densely populated. This can be due to a variety of reasons, including the difficulty of carrying out work in a busy location or the limitations of state aid rules which prevent money being spent in certain areas. Those of you living in blocks of flats might also find your choice of broadband is more limited. Some new properties are having broadband installed during the build, but this may restrict you to one provider or type of broadband (though nowadays you be lucky enough to find that your new flat has ultrafast FTTH!). If broadband is important and you’re in the process of looking for a new home then it is worth spending some time researching availability before moving house. You can check fibre availability at the Openreach web site. This includes a handy map which shows both present availability, and potential future coverage too. Virgin Media does not offer a similar tool, though you can register for updates when checking Virgin coverage. Most FTTH networks will also have an option to express interest in their services. What can I do if I can’t get fibre optic broadband? If fibre is not currently available in your area there are a few options. First, check whether you can get standard ADSL broadband. While nowhere near as fast as fibre, it is still perfectly capable of handling downloads, video streaming, gaming, social media and just about anything else a typical household could want from a broadband service. It's can be very cheap, too. If ADSL is not available, or you need a faster connection, you’ll have to explore alternate services outside the mainstream offerings. 4G mobile broadband is now capable of providing a very fast connection that can exceed standard home broadband. However you will find that it is more expensive, and the data limits may be too small for your requirements. It is also reliant on a strong signal and that may not be available if you’re in a location which lacks even basic fixed line broadband. Satellite broadband can provide a superfast connection anywhere in the UK - the only requirement is that you're able to mount a dish with a clear view of the sky. But satellite is more expensive to install and operate. Data usage limits are common too, though increasingly providers are offering affordable packages with off-peak unlimited use. However the biggest drawback of satellite is its very high latency which can interfere with VoIP (e.g. Skype), remote desktop access and online gaming. Another route to consider is a community broadband project. In some rural areas residents have clubbed together to split the cost of installing a high speed fibre optic line. Some fibre network providers - such as gigaclear - will also undertake an installation if there’s sufficient interest from the community. While these DIY projects can take some time and effort, they can also get you a gigabit broadband service that’s much faster than the broadband available to most of the UK. Home vs mobile broadband: can you use 3G and 4G mobile internet for home broadband?